T2DM is a complex metabolic disease characterized by defects in insulin action, progressive β-cell dysfunction and hyperglycemia. Although there are shared features between the pathophysiology underlying both diseases, the detailed molecular mechanism as to how T2DM increases the risk of AD remains to be solved . Insulin resistance, the core component of T2DM, is developed in the early, pre-diabetes stage by a multifactorial process with environmental and genetic influences . 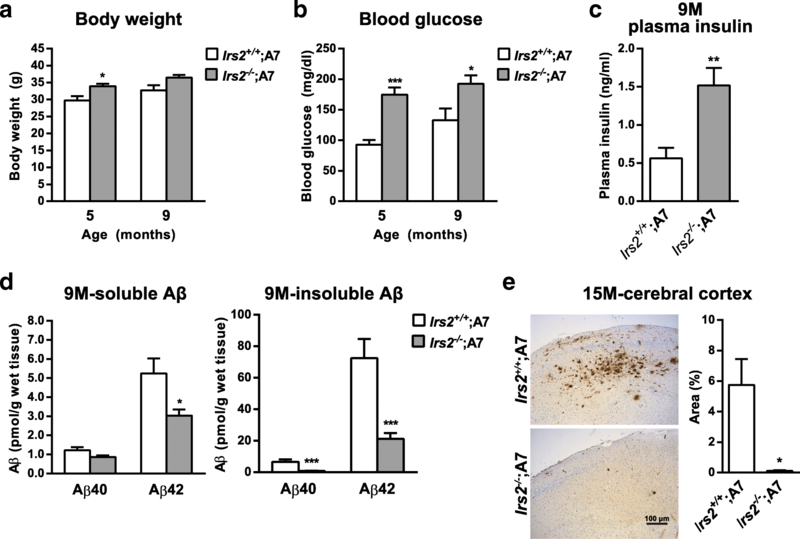 Recent studies have suggested that insulin resistance is also developed in the brains of AD patients, leading to the notion that insulin resistance is involved in the potential causal mechanism of AD [6–8]. Insulin resistance could influence the pathophysiology of AD in two possible manners. Insulin in the brain is thought to derive mainly from the periphery. 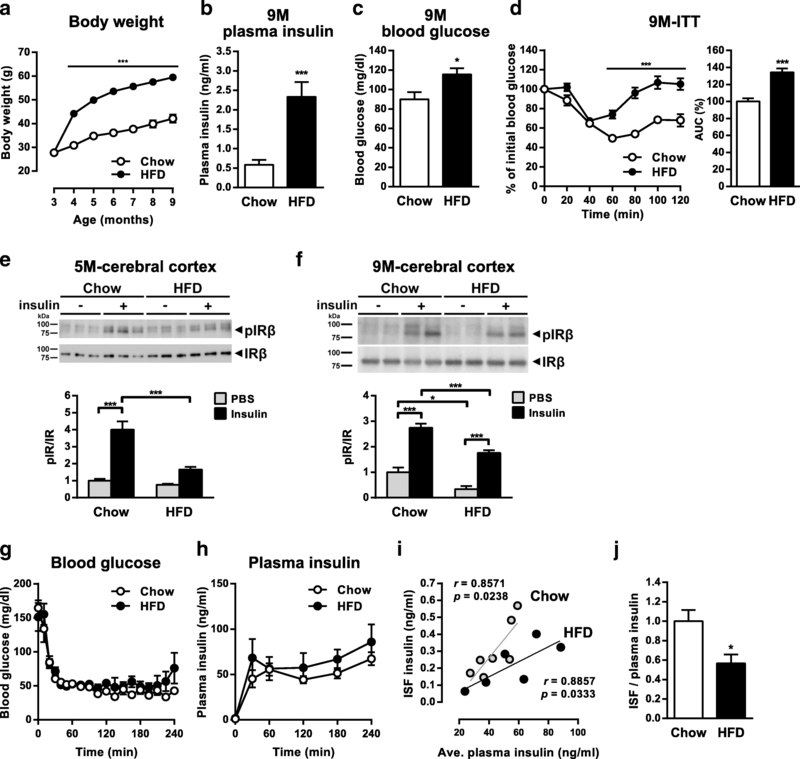 In the central nervous system, insulin is involved in the regulation of the feeding behavior, whole body energy metabolism, as well as in memory and cognition by modulating synaptic function, neuronal survival, and neuronal glucose metabolism [9–11]. Patients with T2DM have been shown to develop cognitive dysfunction , in which dysregulation of brain insulin signaling is implicated. Recently, intranasal administration of insulin has shown to improve memory and cognitive functions in healthy elderly individuals as well as in patients with T2DM, mild cognitive impairment and AD [10, 13, 14]. Based on these observations, part of the cognitive deficits of AD due to T2DM could be attributed to the impaired brain insulin signaling . The other important aspect connecting insulin resistance and the risk of AD is the effect on AD-related neuropathology in the brain. Peripheral insulin resistance was shown to be associated with a higher risk of AD . Furthermore, a histological study on postmortem brains of a large cohort Hisayama study revealed that insulin resistance was associated with an increased risk of senile plaque formation . The association between insulin resistance and Aβ accumulation in the brains of middle aged adults has also been shown by an amyloid PET neuroimaging study . 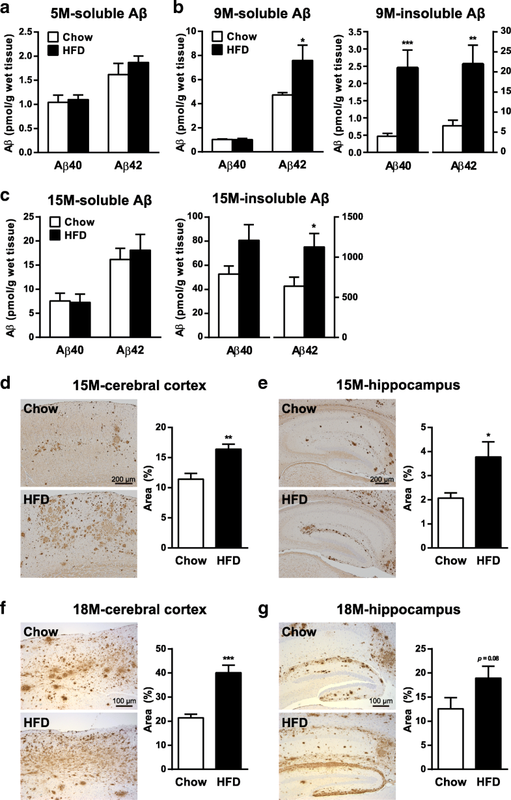 Studies using various experimental mouse models of AD support the observations in humans; induction of insulin resistance and related diabetic phenotypes by feeding a high-fat diet (HFD) increased Aβ levels and amyloid deposition in the brains of AD model mice [19–21]. Collectively, insulin resistance either in the periphery or in brains appears to be correlated with the Aβ accumulation. A majority of previous studies in humans and research models suffered from limitations in unraveling the causal relations between the development of insulin resistance and the progression of amyloid pathology, because they have often been conducted in late stages of the disease where the AD pathology, especially the amyloid pathology has been fully developed. In considering the potential application of anti-diabetic therapeutic strategies on AD, it is critical to determine whether T2DM-induced exacerbation of AD pathology would be a reversible process. Furthermore, the molecular mechanisms of “brain insulin resistance”, which could either be due to impaired response of brain cells to the extracellular insulin or disrupted transport of blood insulin into the brain, have long remained unclear . Notably, an in vivo examination of parenchymal insulin in relation to the metabolic abnormalities within brain areas affected in AD, e.g., hippocampus and cerebral cortex, has been lacking. It is also unknown how insulin resistance affects the brain Aβ dynamics in vivo. Another important question arose from the observations in mice that lack genes encoding components of the insulin signaling pathway, which have suggested the protective effects of genetically reduced insulin signaling on amyloid deposition, cognitive function and survival of AD model mice [23–26]. These lines of paradoxical observations raised a question as to the consequences of reduced insulin signaling on AD pathophysiology. 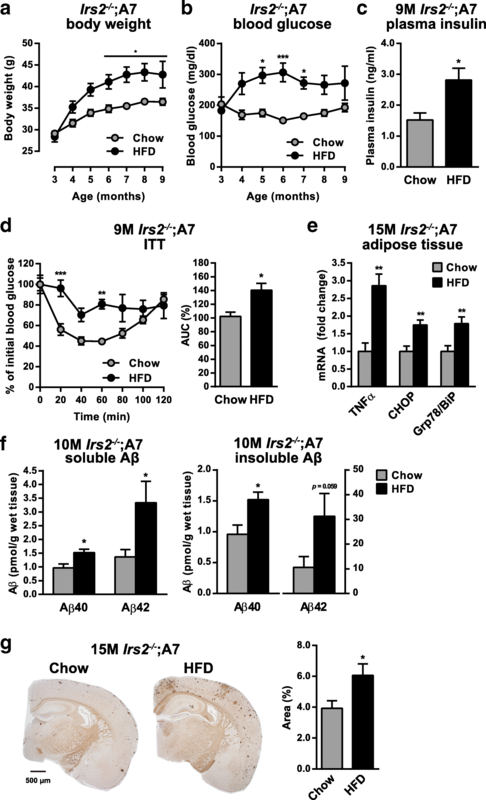 Consistent with earlier studies in other AD mouse models [19–21], Aβ deposition was significantly enhanced by HFD feeding in the neocortices as well as hippocampus of aged A7-Tg mice (Fig. 2d-g). Quantification of percentage areas covered by Aβ immunoreactivity showed a ~ 2-fold increase in amyloid deposition in HFD-fed mice. These results revealed that the HFD-induced impairments in insulin signaling both in peripheral tissues and brains precede the increase in Aβ levels in the brains of A7-Tg mice. “Brain insulin resistance” could be due to either impaired response of brain cells to the extracellular insulin or disrupted transport of insulin to the brain . Impaired response of brain cells was suggested by insulin stimulation assays of the brain tissues in vitro [8, 39]. With regard to the brain entry of insulin, the effect of metabolic overload on the insulin transport from blood to the brain parenchyma has remained unclear. We demonstrated that the ISF/plasma insulin ratio during the hyperinsulinemic clamp was reduced in HFD-fed A7-Tg mice (Fig. 1j). Decreased ratio of insulin in the cerebrospinal fluid (CSF) to plasma has previously been shown in insulin resistant conditions in humans and dogs [40–42], although it remains elusive if the changes in CSF recapitulate that in brain ISF. A few attempts to directly measure ISF insulin in the rat hypothalamus using the microdialysis technique showed that a meal or peripheral insulin infusion affected the levels of hypothalamic ISF insulin [43, 44]. It has also been shown in APP transgenic mice that an acute and modest elevation of the levels of peripheral insulin has no effect on the levels of ISF insulin . 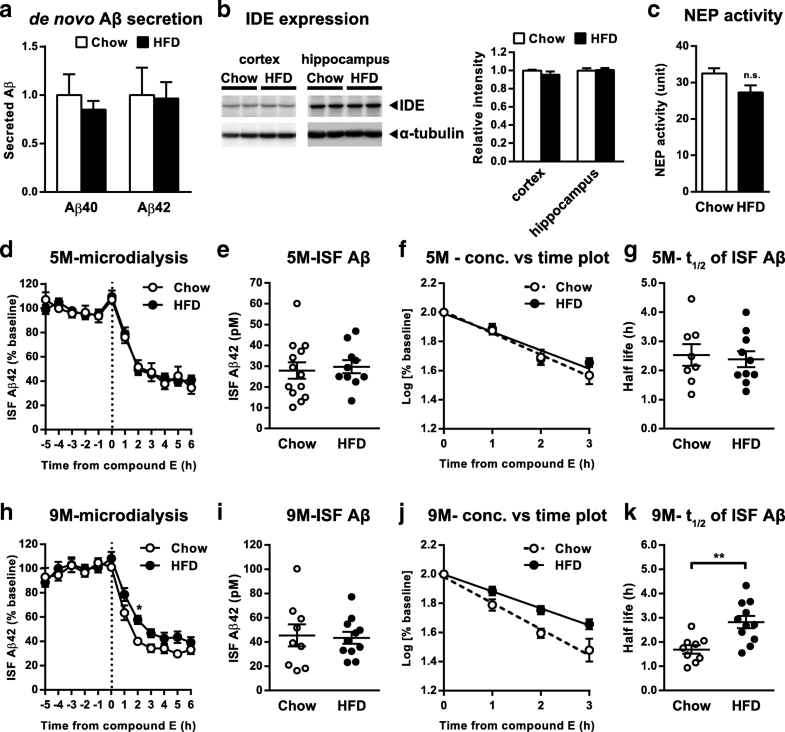 However, it remained unknown whether the ISF insulin levels are altered under metabolic abnormalities within brain areas affected in AD, e.g., hippocampus and cerebral neocortices. Although multiple physiological processes other than insulin action might have been affected during the hyperinsulinemic clamp, and the quantitation of the basal ISF insulin levels should have enabled a more precise determination of the changes in brain insulin transport, our current observations under the condition of hyperinsulinemic clamp support the hypothesis that defective insulin transport to the brain might be one of the underlying mechanisms of diet-induced brain insulin resistance. Similar mechanisms have been suggested in the skeletal muscle, where HFD-induced impairment of insulin signaling in the endothelial cells contributed to the delayed insulin delivery to the interstitial space . 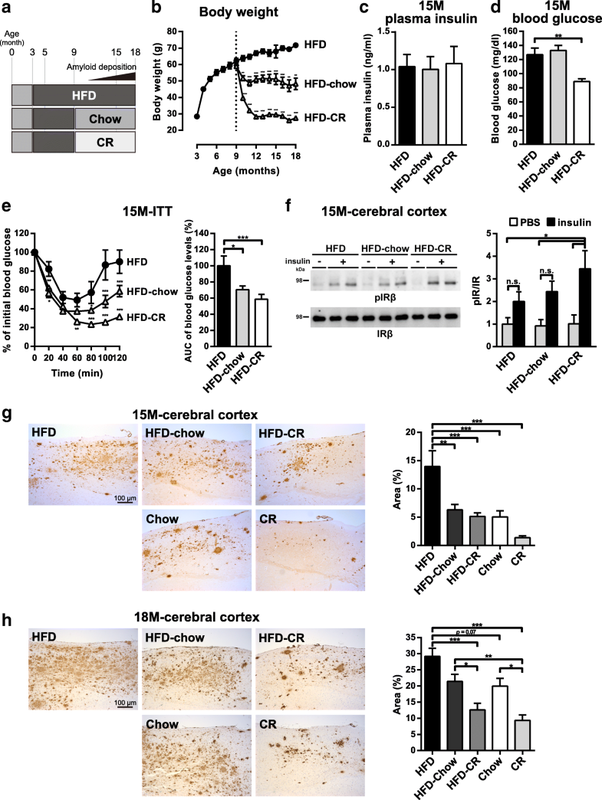 Whether impairment in insulin signaling in brain vessels contributes to the HFD-induced reduction in insulin transport to the brain should further be examined.